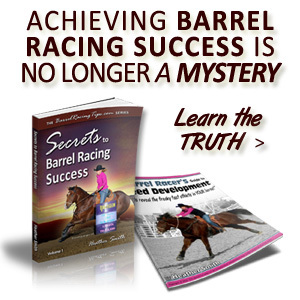 Whether you’re ready to obtain sponsorship to help support your barrel racing habit ASAP, OR if you just want to learn more about the process for future reference, there’s an important First Step that applies either way. That is to take a look at your outlook surrounding the IDEA of pursuing sponsorship. You’re likely to fall somewhere in the middle of two camps. A. Think sponsorship is only for pros, and would never dream of seeking sponsors until you’re winning at a professional level. You’re a realist, you’re independent, you work hard, you’re not looking for handouts. You don’t mind earning your way to the top, even if it means doing it alone. 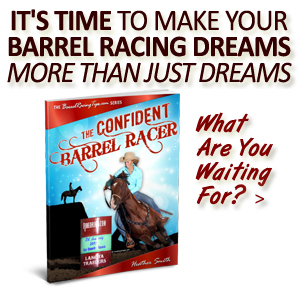 You’re confident and want to advance your barrel racing career, but deep down you might be a little hesitant to take the leap. B. Don’t have a lot of experience with barrel racing, but you have a lot of enthusiasm! And although you don’t have a history of high placings, wins or countless hours in the saddle, and can’t offer anything yet in return for sponsorship, you feel as though you deserve sponsorship because of what you know you can win in the future – with the right kind of support. Which one of these examples do you tend toward? If it’s person A., it’s possible that a closed, unreceiving mindset may be blocking any potential support. Chances are you’ve got some significant accomplishments under your belt, but perhaps you haven’t seriously struck out on your own yet. It might even seem as though you’re stuck in “amateur mode” at times. 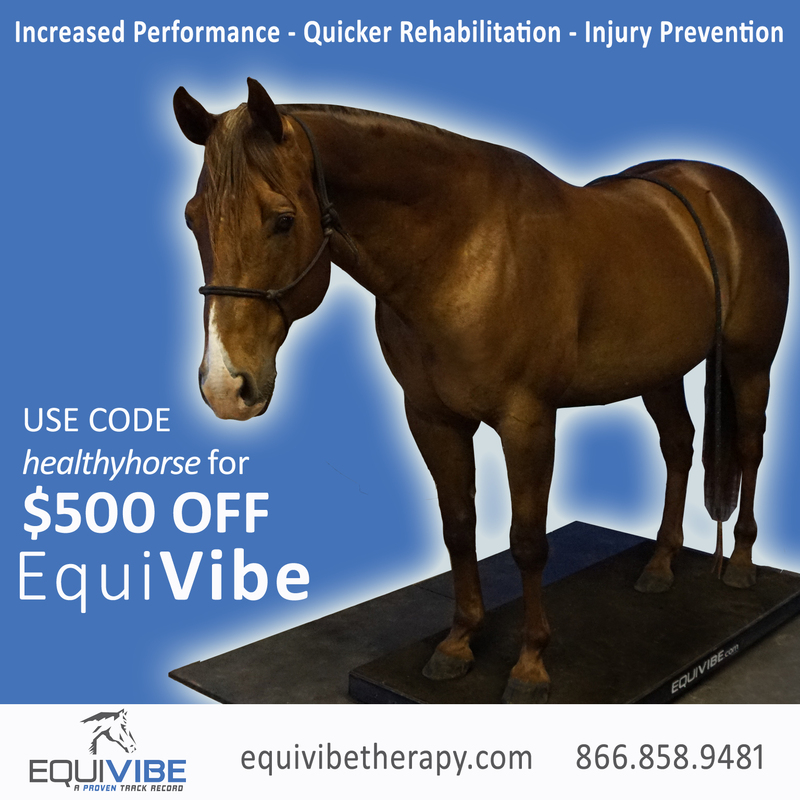 Maybe you haven’t dove quite deep enough to have personally felt the pain of doing relatively well financially, yet still not having the funds to keep horses and wheels going down the road. But when the burning desire to compete at a higher level meets flaming reality – it’s likely that your mind will spin in a direction that leads you to seek additional support. If you tend toward person B., there’s work to do. Asking a sponsor, or anyone to invest in “what could be” is a lot like asking for a loan with no credit history (try to avoid that completely if you can). Whether you ask your Grandma for $20 or a local business for $1,000 in product, they want to know that investing in you is a worthy cause, which is determined by your past behavior and competition history. You don’t necessarily have to have a long list of big wins, but it’s ideal to have a record that shows that you’re the kind of person that would be a positive ambassador and representative of their name or business. Whether a sponsor expects only a simple smile and “thank you” in return, or a lengthy contract, shirt patches and a trailer wrap – they want to know that the support they offer will be put to good use. What is Step One comes down to, is that sponsorship isn’t likely to materialize with a mindset of unworthiness OR entitlement. Anything is possible if you want it bad enough, but sponsors or not – barrel racing success doesn’t come without belief in yourself AND a lot of hard work. “Taylor is one of those girls that when she puts her mind to it there is no stopping her. We got her a pony for free when she was three years old. 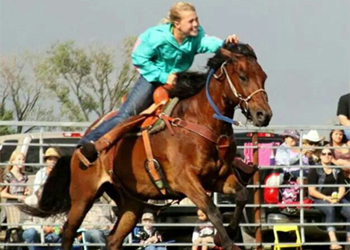 When she was four she decided it was time for a big horse so she could go to rodeos and start barrel racing. At the age of five she saved up enough money to buy herself a little grey mare and it has progressed from there. We do not have the money to help as much as we would like, so to get her to and from the rodeos I started working for the local rodeo contractor setting up the arena in the towns we travel to and in return they haul her horse for her. Taylor has taken what she has and made it work!! She took that mare and started running barrels and although she did not have the best of luck, she always did her best and kept at it. She is now 11 and has bought herself another horse and taught him the barrel pattern herself and has got him running really well. Word got out through family and friends how this little girl’s determination has gotten her where she is and they started offering sponsorship. My aunt and uncle own a tree service and were one of the firsts to sponsor, then a little local bar owner would throw her a $20 at every rodeo he saw her at. Even her daycare sponsored her, and of course Grandmas and Grandpas helped whenever possible! Step Two is to make a list of what you can OFFER potential sponsors. That’s right. You see, sponsorship is not all about what you can GET. It’s about developing mutual beneficial relationships. Before you begin to think about what you want to receive, first make a list of what you’re capable of giving. Of course, not all sponsors are going to expect or need something specific and tangible in return. For example, let’s say you’ve qualified for the NBHA World but need help with traveling expenses to get there. If you have a supportive network of friends and family, consider creating a GoFundme account to help cover your expenses. On that level, it’s possible folks would be glad to receive nothing more than the good feelings that come from helping you out and an update on your experience. How valuable your “name and likeness” is will guide you toward the types of sponsorship relationships to pursue as well. Which brings us to Step Three. 2. How truly available are you to give either? 3. Does sharing your image and/or time make sense? Remember, a sponsorship should be mutually beneficial relationship – almost like being a paid employee, it’s a trade off of sorts. Your limited time might be better spent directed toward building your own career or business vs. helping to build someone else’s, for what might amount to a relatively small amount of “pay” in return. Remember also that every relationship we create in life requires a time investment to maintain. If you’re not smart and realistic about valuing and utilizing your time, sponsor relationships could end up costing money. For example, if it takes $5.00 in paper supplies and postage, $5.00 in fuel, and two hours of time for a $100 donation – is it worth it? 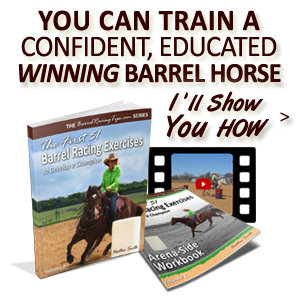 Being a successful barrel racer requires business savvy. 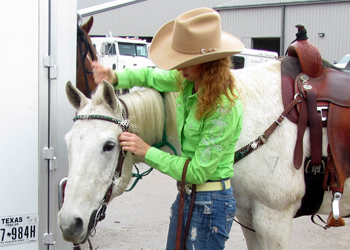 Inspired Turquoise Tack keeps us sparkling! It’s also important when you set out to establish sponsorships, that it’s for the right reasons, which should NOT be to fluff your ego. The goal isn’t to get sponsors because it sounds FUN or to make you FEEL like somebody, but to work together with others in a way that benefits BOTH parties, and even the barrel racing industry as a whole. The higher level barrel racer you are, the more valuable your image is. If this is the case, you’re likely to receive more benefits from sponsors, but also have more obligations. Some local businesses may not be able to give near as much as a corporate sponsor would, but won’t require as much in return either. Any obligations you sign up for must be followed through on, as well as worth what you receive in return, and vice versa. Avoid diving into a commitment that isn’t right for you, or one that will be difficult to hold up. If an agreement isn’t right for one person, it’s not going to be right for the other one either. In these cases, you risk burning bridges, not only for yourself but for other barrel racers as well. 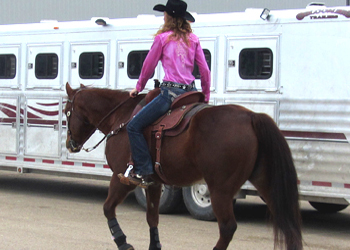 Depending on your situation, putting in some overtime at work or taking another horse in for training might be a better option to raise extra funds for your barrel racing. 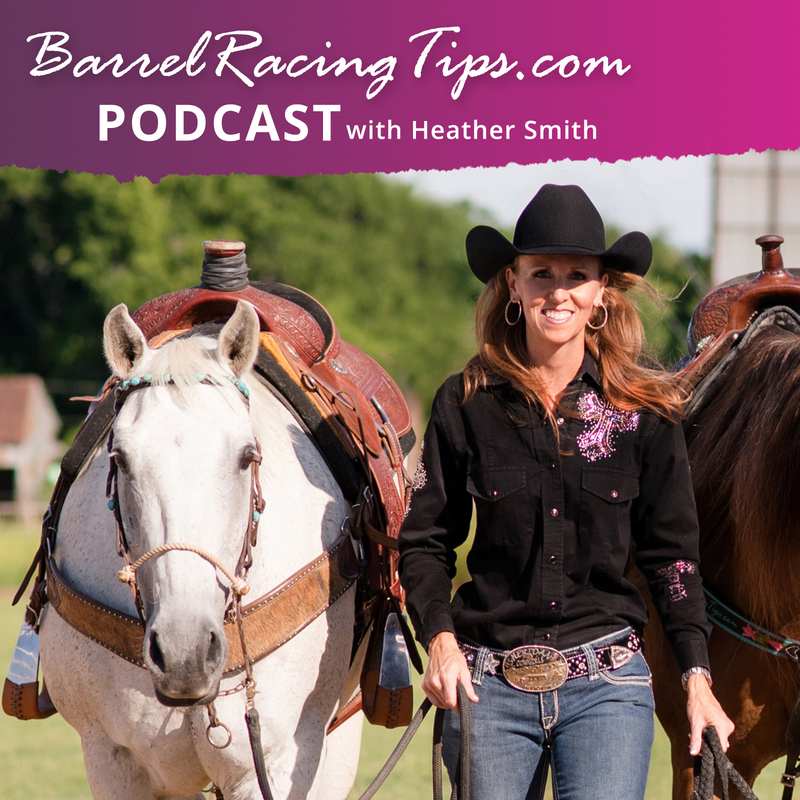 It all depends on how much value you bring potential sponsors, and whether you really want to lend yourself to them or not, which (be prepared) does take time and focus away from doing what you love most and do best – running barrels! As you’re beginning to see, there’s more to this process than meets the eye. Finally, Step Four involves determining what TYPE of support you’re looking for. Now this IS the FUN part! Even though there’s a good chance you won’t secure a sponsorship for every prospect you contact, remember that good relationships take time to develop and maintain, so let your imagination run wild to create this list but then consider a “quality over quantity” theme going forward as you eventually narrow it down. I would personally rather maintain quality relationships with six higher level sponsors, than put a similar amount of effort forth toward maintaining relationships with 20 smaller scale sponsors. Again it all depends on YOU and YOUR situation, the level of sponsorship you’re pursuing and what kind of resources you have to work with. With all the possibilities swirling in your brain, let me also suggest that you focus on seeking out the products or services that you already use and know well. It may also make sense to pursue companies that can offer you product and services you really NEED most, such as hay, fuel or vet. expenses over items you just WANT and don’t have a history of purchasing as often, such as bling tack sets or hats. Feel free to split your list into “want” and “need” categories with your first choice and second choice for each type of service and/or product. 11 year old Taylor running in her new sponsored barrel saddle. If you think what you have to offer a potential sponsor fits well in proportion to what you want to receive, then you might have a match! You won’t know until you ASK however, which is Step Five. If you’re not already very familiar with the company’s products and services you plan to pursue, do your home work. Learning as much as possible about each potential sponsor will prepare you to be a well-educated ambassador of their products and/or services. Research is also a necessary part of finding out who you’ll need to contact and where you’ll need to send your Sponsorship Proposal Packet! Large companies may have an actual Director of Sports Marketing, but if it’s not so obvious where to send your information based on what you can find on their web site (some companies have online forms you fill out), you may have to do some investigating by phone to get the correct name and address to ensure your information gets in the right hands. At this stage, consider Google your best friend. Putting a ton of thought time into a proposal packet, but a half hearted effort into getting it to the correct person is no way to go about it. Have respect for the reader’s time by keeping your packet short, sweet, to the point and no more than four pages. You can also consider condensing your proposal into two pages. If you go this route, combine the information suggested on Pages 1 & 4, then 2 & 3 mentioned above. In today’s digital age, you could also consider sending your proposal via email. If sending via snail mail, paperclip a business card to the front of the unbound paper, OR place the pages in a simple, slender folder and send in a manila (or even better, FedEx) envelope. Now, for step SIX – the Follow-up. Just when you think the hard work is over, two weeks from date you sent the packet is a good time to follow up. Ask if they have received and had time to review your application/proposal. Keep a log of the dates you sent mailings and called or emailed to follow up. While you want to be patient, respectful and understanding of busy schedules, don’t be afraid to be a little bit of a squeaky wheel. You want to be unforgettable in a good way, but not annoying! Either you’ll receive a thumbs up, a thumbs down, or you may even do some negotiating at this stage to ensure the agreement is a win/win. Be creative yet specific, and don’t hesitate to politely ask your sponsor what they look for in endorsees or if the timing isn’t right – how you could best serve them if a future opportunity came available. Whether you seal the deal by email, contract or handshake – only do so if you are absolutely certain you can follow through with any obligations you’ve been presented with. If you get turned down, keep in mind that just because you need or want support doesn’t mean those you ask will be in the position to give it, OR feel as though you’re their ideal partner. When this happens, keep in mind that it’s not necessarily about you. In barrel racing and in life, we have to learn how to take criticism seriously, but not personally. You’re putting yourself out there, and opening yourself up to potential rejection. But again, it’s not necessarily about YOU – keep your emotions out of it, remember this isn’t about ego. Never forget that you have to believe in yourself before anyone else will. Even if you’re not match for a certain sponsor, it doesn’t mean you don’t still have a lot of value to offer the right business. 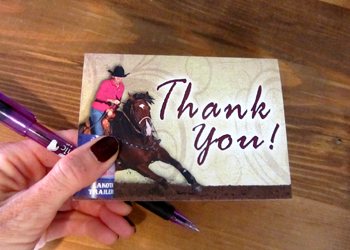 Even if you aren’t successful in creating a sponsor relationship, a hand written thank you card is an excellent idea to thank the recipient for their time and consideration, which will go far in the event that the time IS right down the road. If you want a dozen sponsors but aren’t willing to write a dozen cards, or if you’re not willing and able to maintain contact with those who support you, then sponsorship becomes something businesses are less likely to continue offering into the future. People who seek “something for nothing” or make empty promises will only sour companies from supporting other competitors and damage the industry as a whole. 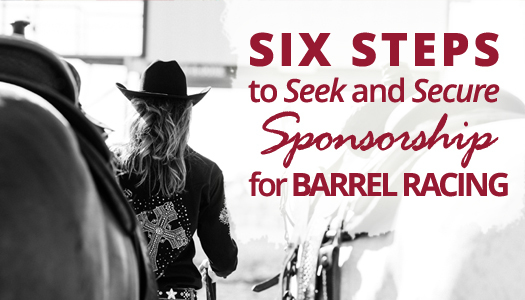 If you’re serious enough about your barrel racing to seek sponsorship, then professionalism on every level is a must. Be professional and treat it like a career. Once you have secured a sponsorship agreement, make it your goal to over-deliver in the appreciation department. Again, never underestimate the power of an “old school” thank you card. Keep in touch, and absolutely follow through with whatever you have agreed to offer in return. When you’re at the forefront of your sponsors mind throughout the year, you’re likely to be one of the first they think of when sponsorship considerations roll around again the following year. Of course, not all sponsor relationships come about through the formal process like I’ve outlined here (remember Taylor?). Feel free to adapt what I’ve shared and tweak it to suit your own needs and that of your potential partners. Most importantly remember that it’s about developing a give and receive relationship that is mutually beneficial. As with any type of relationship, only jump in for the right reasons, and with significant forethought and consideration. At the highest levels, sponsors may pay athlete’s entry fees, travel expenses and some even receive salaries and bonuses based on their performances. Many of today’s top rodeo athletes could not do what they do without the support of such gracious supporters. I loved seeing the video on the story of NFR barrel racer, Michele McLeod that Purina put together. This level of video production is not something that most of us have access to, and after going viral it was certainly something that amplified Michele’s image and increased her fan base as professional athlete, who now happens to be offering clinics. As you can imagine, her relationship with Purina is a WIN/WIN. Sponsors make athletic events and careers possible and available for fans to enjoy. They play a huge part in keeping the barrel racing and rodeo industries thriving and essentially the western heritage from which it was born, alive and well. Individually, we can all do great things – but when we work together in partnership, we can do much more. 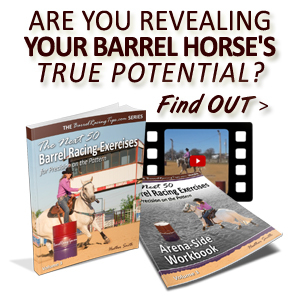 So are YOU ready for this BIG step in your barrel racing career? GREAT article Heather! I definitely fall into category 2 as I am really just getting started. This article truly gives me A LOT of food for thought and direction. Thank you for the article, I fall under category 1, I just never thought I was good enough to get a sponsor. You have opened my eyes and made me realize that I never know until I try. One of my biggest sponsor that I would like to get is Troxel helmets considering I wear a helmet when I barrel race and love their helmets! I would also like to get some local companies that I buy feed from. I will start doing my research and writing my Sponsorship Proposal Packet! I can finally put my business degree to use! Thank you again for the great article. Thanks for the info, Heather. I definitely fall into category number 1. I guess growing up in a different riding discipline you didn’t “ask” for sponsors- they approached you. I do have to say that I deal with people asking for sponsorships EVERY day. The company I work for receives HUNDREDS of requests per month, and something that everyone needs to remember is how to be gracious when a company says “No.” Calling or emailing the person or company and hounding them as to why they made the decision they did does NOT make it likely that they will want to look at you in the future. Just accept it, say “thank you for taking the time to consider me” and move on with grace. Maybe someday you will be the person that company (or another- and people in the industry DO talk to each other) is looking for in upcoming years. It may not be personal- a lot of companies have budgets, too. Excellent point, thanks for sharing! When corresponding with a perspective sponsor, I even think it’s a good idea to send a THANK YOU note for just taking the time to consider! 🙂 It all goes back to truly having a “Go-Give” mentality without a sense of entitlement. Like you said, a “No” might just mean “not right now,” and it’s best to leave each interaction on a positive note! Thank you so much for this article! I’ve been wanting to get sponsors but did not know how. Now I know where to begin!